How to prevent residential construction accidents related to fall from height? Falls from heights are the most common cause of construction workers deaths and this number is especially concerning in the residential construction sector. 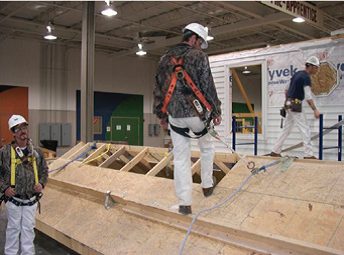 To address this issue, OSHA is now enforcing similar safety standards in home building and in commercial construction. Despite this effort, falls in residential construction continues to kill thousands of construction workers every year. Recently a group of researchers from the Washington University of St Louis joined forces with the Carpenters’union and residential contractors to launch 3 initiatives targeting apprentices, foremen and contractors as part of a research study. A revised apprenticeship training taught foremen and contractors how to choose fall prevention methods adapted to each specific situation and subsequently how to communicate these methods to their workers. As part of the study, contractors can also try new fall protection equipment on their construction site. Participants not only increased their fall prevention knowledge but also communicated better between themselves about fall risks and how to prevent them. The study also led to a higher use of fall protection devices by workers.